A team of researchers from the School of Health Sciences have received one of The Stroke Association’s prestigious Priority Programme Awards to investigate the benefits of peer-befriending for people with aphasia. The team, which is led by Dr Katerina Hilari from the Division of Language and Communication Science, will use the SUPERB trial (SUpporting wellbeing through PEeR Befriending) to specifically find out if peer support can avert some of the adverse psychological consequences of aphasia, the language and communication disorder that affects about 15 per cent of those who have a stroke. 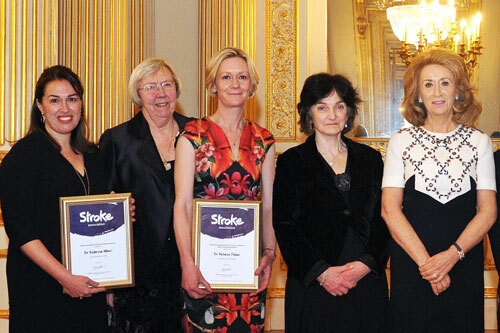 Dr Hilari was presented with her award at a ceremony at Lancaster House in London. SUPERB is an exciting interdisciplinary project involving partners from speech and language therapy (Professor Jane Marshall, Dr Sarah Northcott) and mental health (Professor Alan Simpson, Dr Chris Flood) from City and external collaborators from Connect – the communication disability network. Researchers from the University of Nottingham and King’s Clinical Trials Unit are also involved in the study. As part of the trial, stroke survivors with long-term aphasia will be trained as peer befrienders and will then be paired with individuals with aphasia who have had more recent strokes to offer conversation, help with problem solving and social activities. The peer befrienders will start visiting the participants with aphasia soon after they are discharged from hospital. Following a 1-year development phase, the trial will start: 60 participants with aphasia will be recruited from NHS Trusts in and around London. All will receive the usual care offered by their Trust, but around half will also receive peer befriending. Participants will also complete questionnaires on areas such as mood, confidence and social activity several times during the study, and ‘significant others’, such as spouses, will also complete questionnaires in an aim to show whether those who are close to stroke survivors also feel the benefits of peer support. The possible benefits for those who provide peer support, i.e. the peer befrienders, will also be explored by interviewing them and testing their mood and feelings of self-esteem.